One of my favorite treats to whip up has to be Rice Krispie Treats – all ooey and gooey with extra marshmallows. It’s an easy dessert to make and it’s guaranteed to please even the pickiest of dessert eaters. 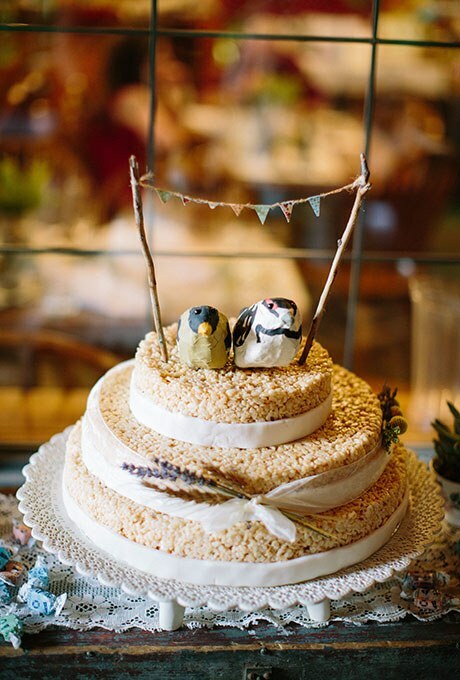 So, how fun would it be to serve a Rice Krispie wedding cake? This has to be one of the best non-traditional wedding cake ideas I’ve seen. Even if you want to have a “traditional” cake for the bride and groom – this krispie wedding cake idea would be great for a dessert table. Or you could forgo a traditional cake and just serve this three-tier Rice Krispie treat cake. It’s fun and unexpected and no one would forget your wedding cake! You can find this fun non-traditional cake here.